Article contributed by Field Staff Writer K. Slye. Archery season is still a few months away here in Pennsylvania, but it’s never too early to start preparing for the fall. Shooting as much and as often as possible will help shape and hone the necessary skills to be successful with stick and string. The best way I know how to do that and to simulate hunting situations is to shoot at local 3D archery courses and competitions. While growing up, my Dad and I would go to an archery shoot just about every weekend, from late spring to early fall. 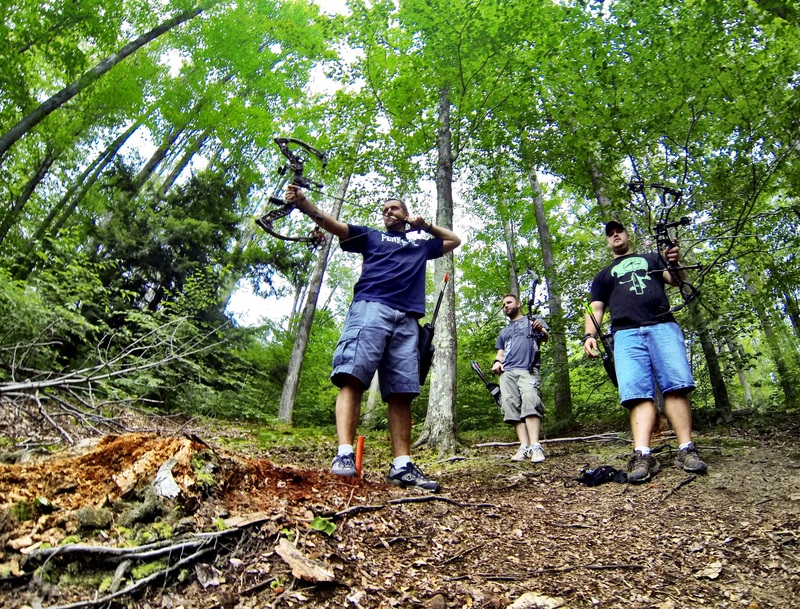 It was a great way for us to practice up for the coming archery season and enjoy a day in the woods with friends. I have many great memories shooting with my Dad and other friends at 3D archery shoots. We placed in the top three teams two years in a row at a local Father/Son Shoot. We regularly attended an annual archery festival at a ski resort in the summer, where we rode the ski lift up to the peak, and shot the different courses that meandered back down the mountainside. I remember being about five or six when I first starting going to the shoots with my dad, using my Panda, a little red youth compound bow made for beginners. 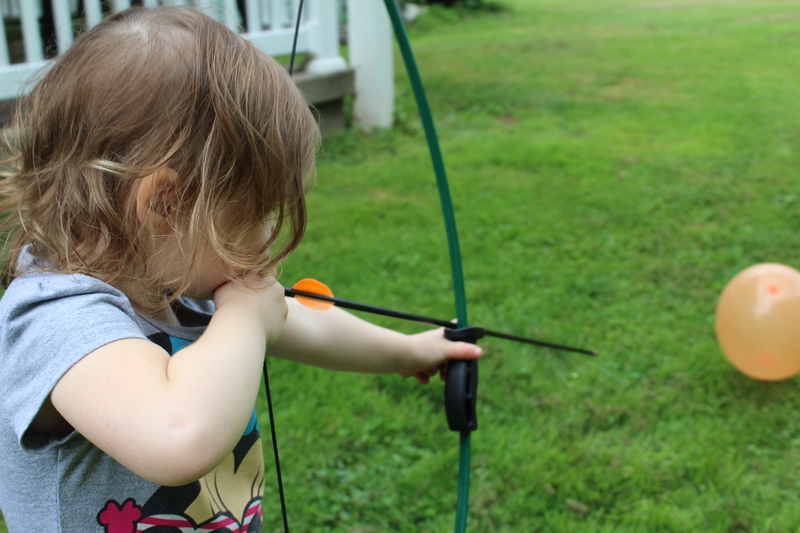 My daughter is three and has shown some interest in shooting her Bear Archery First Shot that a close family friend gave to her as a gift. To make it fun for her we shoot at balloons in the back yard and she has come with me to one 3D course, shooting her bow at the targets when we walk up to pull our arrows. She usually hits the target, even though it just bounces off she still giggles, shouts “I did it,” and gives out high fives. Hopefully she’ll soon join me more often when I go to 3D courses. My Dad has switched to using a crossbow for hunting during archery season because of shoulder issues, so we haven’t gone to an archery shoot together for a while. But, this summer I was able to convince him to come with me to a local rod and gun club for a 3D shoot. He backed down the poundage of his old compound to a manageable draw weight, we hastily sighted it in on the practice range, and headed out to the course. It brought back some good memories and reinforced the fact that shooting the bow is a skill that needs continuous practice. Most courses have 30 total targets, where an archer shoots the 3D target, records the score, retrieves the arrow, and moves to the next target. The targets are various types of game species, from a woodchuck to a buffalo, there are even dinosaur and zombie targets. Shooters are divided into different classes, depending on age and equipment used, this determines what range of distances from which archers shoot. The distances are not posted, so the archer must estimate the yardage and use the appropriate sight pin. The International Bowhunting Organization (IBO) has six different levels of classes, with maximum distances for classes ranging from 25 for level one to 50 yards for level six. Scoring is based on where the arrow hits the target, a complete miss is a 0, hitting the target anywhere outside the vitals is a 5, inside the vitals is an 8, a heart shot is 10, and a perfect center of heart shot is an 11. There are a myriad of different ways that shooting at 3D courses will help prepare an archery hunter for the fall. First and foremost, in my opinion, is the judging of yardages. A hunter can do everything right to get that beautiful buck to walk by, but if there’s no time to use a range finder and the yardage is misjudged only slightly, disastrous results could unfold. Best case scenario is a clean miss, where the animal is unscathed for the hunter to hopefully meet again one day. The worst case scenario, which is an archery hunter’s worst nightmare, is an injured animal that is unable to be recovered. One way to help better estimate yardage is to pick several points between the intended target. For example, the rock that is 10 yards away, and the distance between the rock and the big tree is 15 yards, then it looks like another 7 yards to the target, for a total of 32 yards. It is much easier to estimate several shorter distances than one long distance. Shooting at 3D courses is a perfect way to learn and refine the skill of estimating yardages. Very seldom does a deer walk in to a perfectly open view, completely broadside. 3D courses will help to prepare for a less than perfect shooting scenario. Many 3D courses have targets at various angles, with tree limbs, leaves, and other obstacles and distractions in the surrounding area. This makes it necessary for the archer to concentrate, pick a spot in the vitals, hold, and shoot. Many times I’ve found myself distracted while at full draw, afraid to hit the sapling just to the side of the vitals. My loss of concentration caused me to pull off target and make a bad shot. The key is concentration and to block out all distractions. Another scenario that is common on a 3D course is elevated shooting. In Pennsylvania, archery hunting from a tree stand is very common, but shooting from an elevated position is a skill that needs to be practiced. Bending at the waist instead of lowering the arm is vital to maintain consistency and accuracy. Many 3D courses have the opportunity to shoot from raised platforms that simulate shooting from a tree stand. 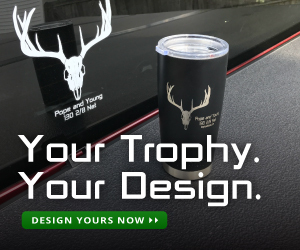 In order to be a successful archery hunter preparation is paramount and it starts with being a proficient and effective shooter in many different situations. Rod and gun clubs are an excellent resource to utilize 3D archery courses to add another level to archery season preparations. Get out there, find a course to shoot, and have some fun in the process. My Daughter learning the finer points of archery while shooting at balloons in our backyard. 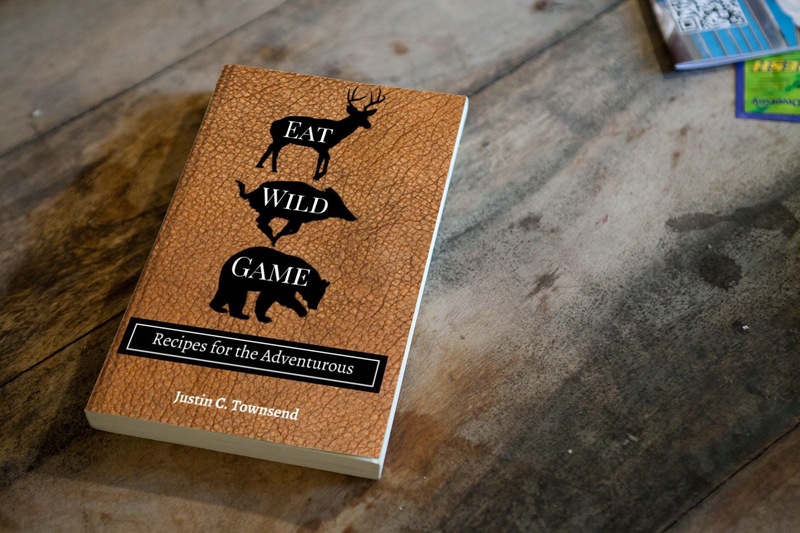 Pingback: Archery Preparation for the Fall | I Am Dad, the Outdoorsman!